COMEBACK pacer Chase Auckland took another step towards his primary target at Tabcorp Park Menangle tonight. Second-up from a 10-month injury-enforced spell, the Mark Purdon and Natalie Rasmussen-trained gelding proved too slick for his rivals over 2300 metres. The son of Auckland Reactor hasn’t raced since curbing a hock during his Northern Derby win. Pleased with Chase Auckland’s performance the New Zealand-based power couple will continue to push for a Chariots Of Fire berth with the four-year-old. As such Chase Auckland will tackle next week’s qualifier – Paleface Adios Stake – which is the last chance to secure a berth in the February 16 Group One. Chase Auckland’s opposition in the heat is likely to include his stablemate Spankem. “It was a very pleasing run,” Purdon said. “That was just his second start from a long break so it will do him the world of good. 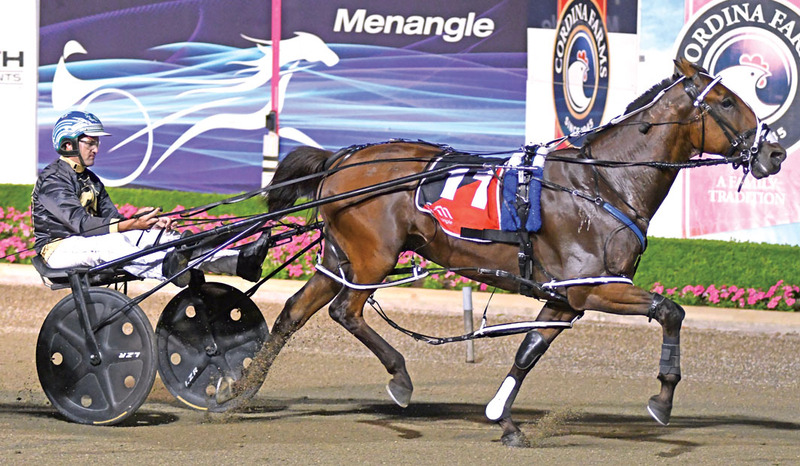 Driven by local reinsman Luke McCarthy, Chase Auckland was given time to settle into his stride from the outside of the front row as Vasari led from barrier two. Sent forward during the middle stages, Chase Auckland worked to the lead at the bell before cruising to a two-and-a-half metre win from Franco Landry, with Dance For Glory five metres away in 1:54.5. Owned by the Alabar Racing Syndicate, Chase Auckland stretched his record to an imposing nine wins and a second from 11 starts for earnings of $405,329.